Rebecca MacKinnon’s new book is an antidote to giddy promises that the Internet will set you free. 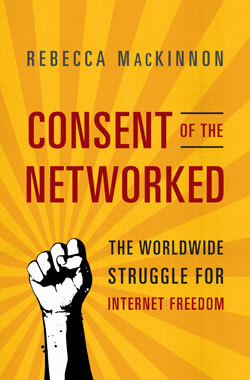 In her timely new book, Consent of the Networked: The Worldwide Struggle for Internet Freedom, Rebecca MacKinnon, a former journalist and current fellow at the New America Foundation, offers a sharp, sobering rebuttal to such heady rhetoric, questioning and complicating our understandings of what it means to be free online. For many in the United States, the recent SOPA/PIPA battle, which prompted a huge amount of attention to the politics of the web, will be an obvious reference point—but Consent of the Networked makes clear that it was just one part of an ongoing struggle over the Internet as a political terrain. MacKinnon’s book presents a cogent picture of the many ways in which our lives, both online and off, are increasingly affected by regulators, politicians, and companies seeking to carve territories into the still-amorphous web. MacKinnon starts out with a world tour of cyberdystopia, detailing the ways in which the freedom and security of activists and dissidents around the world are already under attack. Russia uses the web to manipulate public opinion about the country’s nationalist government and undermine social trust. In Iran, the world’s top jailer of journalists and bloggers, authorities aren’t content with intercepting emails, blocking five million websites, and torturing people for their passwords—in 2011, the government announced a plan to roll out a national intranet, which won’t be connected to the outside world. Under President Ben Ali, the Tunisian government employed hackers to take over dissidents’ social media accounts and access their contacts; the Syrian government still does. Internet users in liberal democracies may think such concerns are far removed from their own lives, where concerns about creativity and copyright rule the day—yet the Manhattan District Attorney’s office has subpoenaed activists’ tweets, the Oakland Police Department is using forensic software to identify protesters, and US law enforcement agencies make thousands of secret requests each year for electronic communications. While not as egregious as crackdowns in, say, Bahrain, such actions nevertheless suggest that Americans too should be paying closer attention to the ways web technology can be used not only by, but against, political dissenters. While MacKinnon is diligent in identifying the ways in which states use the Internet to achieve panoptic power, she gives equal shrift to forms of corporate censorship that may lead to what nonprofit European Digital Rights Initiative has called a “privatized police state.” In stark contrast to their high-minded rhetoric about democracy and freedom, MacKinnon says, companies like Facebook are authoritarian in their assumptions and decisions about their users. (At one point, MacKinnon compares Mark Zuckerberg to Thomas Hobbes—you know, the guy who said that life is “nasty, brutish, and short.”) She criticizes tech companies for putting users in danger by pushing anti-anonymity ideologies or simply not thinking about the different types of people who use their services. Defenders of tech companies tend to point out that no one’s forcing anyone to use their (usually free!) services, and while that’s technically true, MacKinnon explains the reasons why, for many, it’s not a real choice: when everyone else is on Facebook, for example, activists have to be too, even if they’re putting themselves at risk in the process. It turns out inequality is a major issue online, too, where the digital divide increasingly isn’t a question of access, but of what kind: everyone may be able to get online, but what can they do once there? While the fastest growth in Internet use is occurring in the developing world, MacKinnon warns that there could soon be two main classes of Internet users: the wealthy, who have access to a relatively free broadband Internet via their laptops and desktops, and the poor, who primarily access an Internet mediated by a small selection of free apps on insecure, trackable mobile devices. And it’s not hard to imagine that the former, who have greater access to the multinationals and the governments that regulate them, will also be better able to secure and defend the rights most relevant to their lives while freedoms that others rely on are eroded by actions taken in distant countries. While the Internet offers new tools for freedom or repression, the basic political questions at stake are old ones, and it’s a quote not from Clay Shirky or Cory Doctorow but Alexis de Tocqueville that sums up the fear at the heart of the book: “if despotism were to be established amongst the democratic nations of our days, it might assume a different character; it would be more extensive and more mild; it would degrade men without tormenting them.” The most worrying scenario MacKinnon conjures is not an Orwellian world of Big Brother censorship, but one more along the lines of that envisioned by Aldous Huxley, in which “our desire for security, entertainment, and material comfort is manipulated to the point where we all voluntarily and eagerly submit to subjugation.” Indeed, as sobering as accounts of overt state surveillance and violence in Syria and Russia are, perhaps most ominous is the type of censorship practiced in China, in which the government state restricts access to sites it deems threatening—but allows Chinese companies to create government-approved versions, trapping citizens in a “gilded cage” that keeps them engaged but not enraged. Yet it’s not entirely clear what that might look like. While the ideas she offers—things like demanding increased corporate social responsibility and offering advice to companies on how to make their services more appropriate for different needs— are by no means radical, many of them still seem like a long shot. MacKinnon repeatedly refers to the labor and environmental movements, suggesting that users of the Internet should emulate those activists in uniting to demand corporate responsibility—but has either of those movements really succeeded in holding corporate power accountable? Corporate abuses have often simply moved overseas in response to national-level campaigns, and today’s multinationals are larger and more powerful than ever; despite occasional bursts of criticism when new privacy settings are announced or policy positions changed, the power of Internet companies doesn’t seem likely to diminish anytime soon. It’s telling that Lawrence Lessig, one of the web’s first and most prominent scholars and champions, has recently turned his full attention towards combatting the outsized political power of corporations, both web-based and not. Moreover, the Internet presents unique challenges in that its users are not only the consumers of services and content, but also the producers and even the product; should Internet activism look like a labor movement, consumer rights group, shareholders’ meeting, or something else entirely? Perhaps all of the above: MacKinnon describes the diverse array of communities and actors are already working to defend freedom online, from established organizations like the Electronic Frontier Foundation to political parties like Sweden’s Pirate Party, which won two seats in the European Parliament in 2009, to unaffiliated actors like the “hacktivist” collective Anonymous, which recently made headlines for taking down the FBI’s website in response to the shutdown of the file-sharing site Megaupload. To MacKinnon’s credit, she acknowledges the many challenges that lie ahead, noting that the path to a freer, more democratic Internet will be messy, uncertain, and filled with trial-and-error. In any case, the book’s intention isn’t to offer up a set of neat solutions, but to spur all of us to pay more attention to the threats lurking beneath the web’s shiny baubles, and to exhort us to take a more active role in claiming and defending our digital power, rights, and freedoms. In that, Consent of the Networked succeeds admirably; it should be required reading for anyone who cares about the future of the web—that is, for all of us.